Qwest Records proudly releases The Other Two and You from The Other Two, a group with a considerable musical heritage and wealth of provent talent. The Other Two are, namely, Gillian Gilbert and Steven Morris, longtime members of super group New Order (she plays keyboards and guitar and he is the programmer / percussionist). Just as the atmospheric and innovative Joy Division (who defined the Manchester sound that has since evolved into the international techno craze) moved forth to become New Order (who remain one of the most popular acts in the world), so the evolution continues as Gillian and Steven marry their history of creativity with a new-found pop sensibility that marks The Other Two as both familiar and refreshingly new. More than a year before their full-length release, The Other Two launched an auspicious beginning as their international hit single "Tasty Fish" met with an avid response in the States, receiving heavy airplay while only available as an import. In the year since New Order's last release Republic (follow-up to the platinum Technique, and recent recipient of billboard's Modern Rock Album of '93 with its Top Five hit "Regret"), Gilbert and Morris have been writing music for various film and television projects, including Fox's America's Most Wanted and shows for the BBC. This experience exposed them to a new way of songwriting, and they sought to explore this new approach further. The resulting sound takes a marked departure from New Order that is immediately evident with Gillian Gilbert's unmistakably feminine vocals. She soars with an ethereal grace on the first cut never relents. In this new constellation, Gillian provides keyboards and lead vocals, while Steve adds programming and percussion. The working relationship between Gillian and Steven is augmented by a personal one as well, and having such a closeness "makes it hard to stop working, because we are always there in our home studio together," explains Morris. This constant collaboration has produced an abundance of material, so don't expect The Other Two to be a one-shot satellite offshoot. 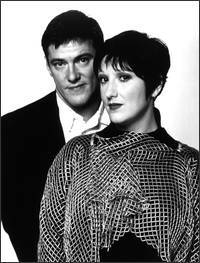 Although they are currently being kept quite busy recording an upcoming New Order release, Gillian Gilbert and Steven Morris look forward to performing live as The Other Two, fashioning an "event" feel for their shows that will recreate their textured, layered sound and break the bounds of a strictly rote performance. The album was produced by Gilbert and Morris as well as Steven Hague, producer of the New Order smash "True Faith." This mixture of the experienced and the exploratory infuses the release with enough of the well-loved, relentlessly beat-driven sound to comfort the legion of lifetime fans as well as an accessible, hook-driven awareness that is sure to attract and intrigue newcomers. Established musicians, songwriters and vocalists in their own right, Gilbert and Morris are much more than a sum of their parts. By forming The Other Two, they have provided themselves with the opportunity to express their versatility with a forthright assurance that makes the term "debut" a misnomer. Their accomplished ability is clear, and this release places them firmly at the forefront of the techno dance-pop explosion that has overtaken radio and clubs around the world over the past year. The Other Two's commitment to pleasing their fans is summed up nicely by Morris when asked for his goals for the group: "We'd like to make people happy." The Other Two are off to a tasty beginning that seems sure to do exactly that.